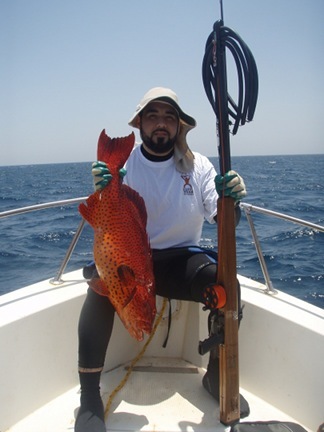 We went spearfishing, me, Jamil and some friends on friday and I speared 4 "Najil" or roving coral groupers, this one was the biggest. I didn't weigh it but it could be around 19 lbs. The gun is perfect, it's very accurate, almost no recoil and very powerful and I enjoyed long shots,I was very impressed by it's performance. I love the gun and all my diving buddies who saw the gun were very impressed, your craftsmanship is super. Thanks a lot Daryl.